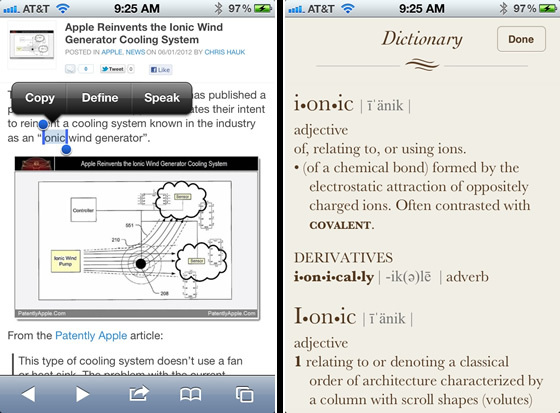 Ever since the 5th major release of iOS, an awesome built-in dictionary feature is easily accessible from Safari, iBooks, and most other apps that you’ll be using on an iPhone, iPad, or iPod touch. This means the next time that you (or someone else) see a word anywhere on an iPhone or iPad that you want to define, you don’t need to don’t bother downloading or launching a separate dictionary app. Because you can quickly access word definitions directly from iOS, and the definition will surface in a quick access panel that makes it easy to read the definition and then get quickly back to reading the original text. Using this trick is incredibly simple and once you get the hang of it you’ll probably be bringing it up often as you read on your iPhone or iPad. Now you’ll know the meaning of that word, and perhaps better understand why that word was chosen or used, leading to better reading comprehension and maybe even a broader vocabulary. This should be incredibly useful for everyone, whether just casual readers, learners, students, educators, or really just about anyone since let’s face it, there are some words we just don’t know, or at least don’t understand in the context of how a given word was used. This quick dictionary trick will usually also provide derivatives of the given word, an example of the definition in use or how it would be used, and a thesaurus when applicable. The instant dictionary concept should be familiar to Mac users, where a very similar feature is in OS X from Lion onward, which also summons a dictionary with a simple three-fingered word tap. Users will find this handy little tip in all versions of iOS and OS X from here on out, even though the interface has changed slightly in the newest iOS versions, accessing remains the same. Double Tap does not work for me in Safari. Tap-Hold 1sec-Release works for me instead. I do not seem to have this option. Is it because i have another language than english? (have tried both danish and english words, or maybe because it is a 3Gs? You need iOS 5 or later to access the built-in Dictionary. That’s really the only requirement, it should work in other languages outside of English. When you use Define on a word in the definition bubble at the lower left is “Manage”. Touch this to get a selection of Dictionaries to download. I need to know how to add a dictionary to that list, so I can reference more dictionaries. Medical or linguistic definitions. « Apple’s iPad 3 Release To Come in March Alongside iPad 2 Price Drop?